One of the problems I noticed with many developers that when they use a module bundler like Webpack, Browserify, etc… they tend to think that it will automagically handle optimization for them just by enabling & using all the optimization plugins available in the tool. But that’s not true, while these bundlers plus their plugins & optmization settings can handle nearly 90% of the this issue, you still need to handle the rest yourself or at least measure & check every once in a while what your bundle looks like. So I’ll show you a couple of things you can do with Webpack to optimize your bundle even more. I have a very simple react app here, you just type in the input field & it will slugify the output of what you typed. That’s the code for the app, pretty normal stuff nothing fancy here. 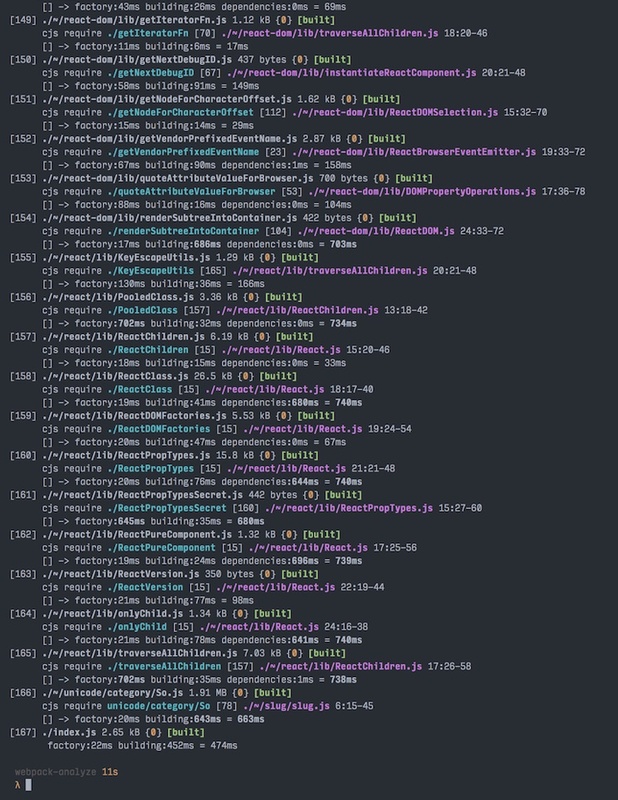 So, you run it through Webpack & eveything is fine, right? It compiles, works & everyone is happy. But look at this output from Webpack. The bundle size is 1.84mb! And there is this file called So.js which is 1.91mb alone, and it’s coming from a folder called unicode/category. How can we get more info about this? Open node_modules & grep, find or even manually to try & find where is that unicode folder is. 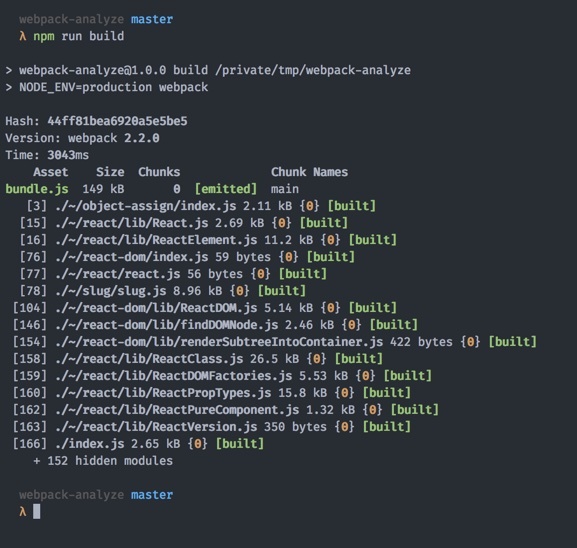 Use Webpack’s powerful CLI flags to get more data & information about your bundle. "debug": "npm run build -- --progress --colors --profile --display-modules --display-reasons --display-error-details"
Tip: you can reuse npm run scripts in other npm scripts & pass flags to them by adding -- between the command & the flags. Like in the debug script here. So now we know that So.js is related to the slug module, great. So it turns out that the slug module, has a postinstall hook that creates some unicode files to handle different languages & So.js is one of them & it holds mainly Arabic & Tibetan unicode symbols. 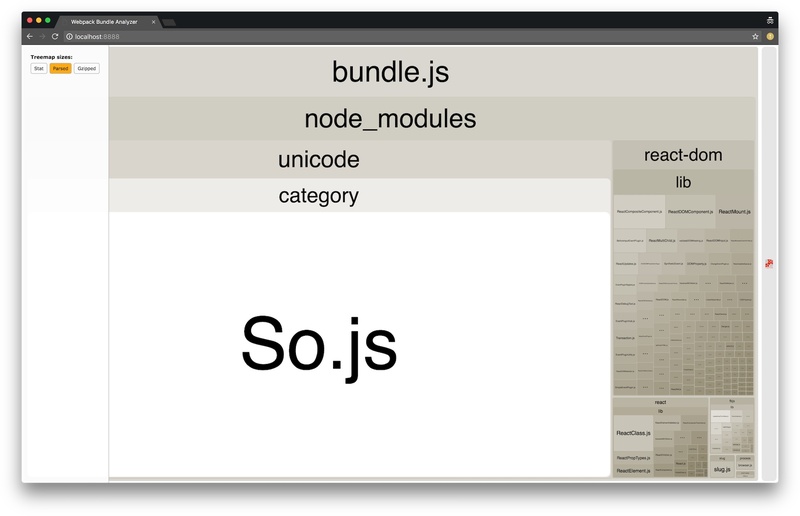 Another solution to check your bundle which can actually help you even, is using something like webpack-bundle-analyzer. Because it visualizes the size of your dependency tree using tree maps, it should look like this. So, the perfect scenario you would use a different module other than slug, but let’s assume that you can replace this right now for whatever reason (time, overhead, etc…) you still don’t want to serve these ~2mb for your users. So how can you do this? Turns out that solutions was pretty simple, you can use Webpack’s IgnorePlugin to tell Webpack to ignore this file from the bundle. And here is the output after that change, the bundle is only 150KB now. 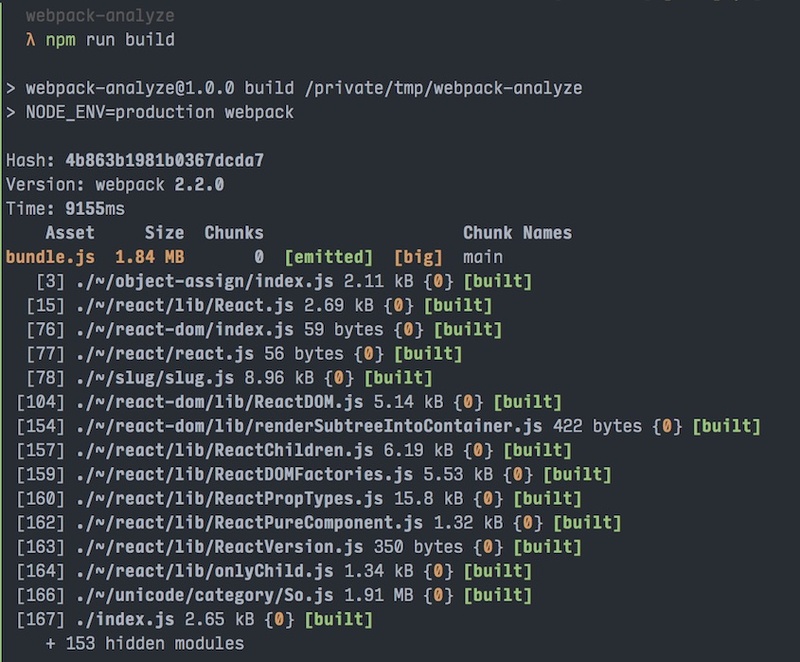 While following best practices when setting up Webpack can go a long way for optimizing your bundle, you still need to monitor it for any sudden size increase and/or audit it every once in a while to make sure things like this doesn’t happen.